BT Financial Group, a division of Westpac, is a leading provider of superannuation, investment and insurance products in Australia. BT Super for Life enables members to manage their superannuation online at btsuperforlife.com.au in conjunction with their online banking. Challenge: Increasing online applications The BT Super for Life website focuses on service and usability with an online application form as one of the key conversion points. In a move designed to measure and improve visitors’ experience and increase conversions, BT worked with Loves Data, a Google Analytics Certified Partner, to conduct conversion optimisation tests using Google Analytics. Solution: Improving conversions through Google Analytics insights BT Financial and Loves Data elected to conduct tests to identify ways of improving the BT Super for Life online application process. The Apply Now page on btsuperforlife.com.au – which is the first page in the BT Super for Life application process – was selected for testing. The ultimate aim of the activity was to increase visitor engagement and conversions by making it quicker and easier to complete the form. 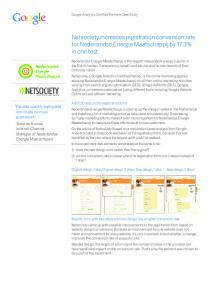 The conversion test was run through Google Anaytics tools to provide BT with accurate results as a basis for decision-making. “The Loves Data team worked closely with us to identify key design and layout elements in the landing pages of our online application process,” explains Ben Hancock, BT Financial Group’s senior website manager. “They created variations of the landing pages with different combinations of the design elements for testing.” The Loves Data team helped BT select the variation to test against the original page. The final test variation displayed the different banks and logos in a drop down selection instead of check boxes. A number of additional smaller changes were made to the layout in order to shorten the page and make it easier to follow the steps. About Loves Data A Google Analytics Certified Partner, Loves Data is a digital marketing agency specialising in Google AdWords and Google Analytics. Loves Data develops integrated online marketing strategies and solutions for measuring and optimising the performance of websites and online advertising results. The company’s Google certified expertise provides clients with the confidence of engaging with a trusted partner and access to the latest techniques. Results: Application conversions increase by over 60% “Working with Google Analytics Certified Partners was essential to running a successful test, which ultimately resulted in significant increases in conversion rates for our online application form,” Ben reveals. The new variation of the Apply Now page outperformed the original page from the beginning and continuously improved throughout the testing phase. 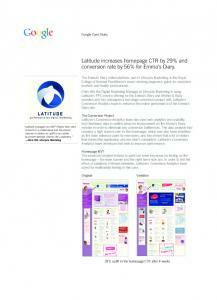 The final result was a staggering 61.70% increase in conversions. By using Google Analytics insights, Loves Data made additional recommendations for improving the BT Super for Life page on bt.com.au too. Google Analytics data demonstrated that a series of minor changes led to a 12.5% increase in the number of people clicking through to the application form. Before testing, important information was buried beneath the page fold. The old version gave no indication of time required to complete the form, and visitors found the two blue buttons confusing when stacked on top of each other.After testing, Loves Data reprioritised several elements, moving less important information aside and using contrasting colours to highlight an important either/or option. 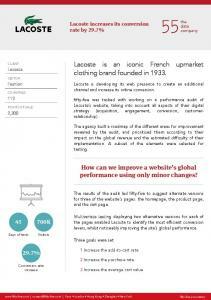 Staying within brand guidelines, the changes drove application improvement. © 2013 Google Inc. All rights reserved. Google and the Google logo are trademarks of Google Inc. All other company and product names may be trademarks of the respective companies with which they are associated. Challenge: Increasing online applications. 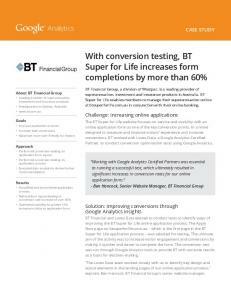 The BT Super for Life website focuses on service and usability with an online application form as one of the key conversion points. In a move designed to measure and improve visitors' experience and increase conversions, BT worked with Loves Data, a Google Analytics Certified. RFC Conversion Course Enrollment Form with REP.pdf. RFC Conversion Course Enrollment Form with REP.pdf. Open. Extract. Open with. Sign In. Main menu.